A famous feature of Mount Everest has collapsed, potentially making the world's highest peak even more dangerous to climbers. 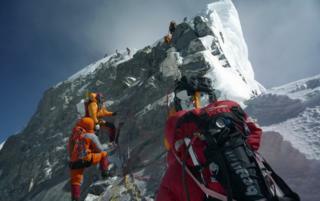 Mountaineers said the Hillary Step may have fallen victim to Nepal's devastating 2015 earthquake. The near-vertical 12m (39ft) rocky outcrop stood on the mountain's southeast ridge, and was the last great challenge before the top. It was named after Sir Edmund Hillary, who was the first to scale it in 1953. British mountaineer Tim Mosedale confirmed the news of the Step's demise on Facebook after reaching the summit on 16 May. Speaking to the BBC, he said the loss of the Step was "the end of an era". "It is associated with the history of Everest, and it is a great shame a piece of mountaineering folklore has disappeared," Mr Mosedale said. Back in May 2016, pictures posted by the American Himalayan Foundation appeared to show that the Hillary Step had changed shape. But thanks to the snowfall, it was hard to tell for sure. This year, with less snow, it was clear the Step had gone. "It was reported last year, and indeed I climbed it last year, but we weren't sure for certain that 'The Step' had gone because the area was blasted with snow," Mr Mosedale wrote on Facebook. He concluded: "This year, however, I can report that the chunk of rock named 'The Hillary Step' is definitely not there any more." Mr Mosedale, who is due to go back up Everest later this month, said he believed the Step was most likely a victim of Nepal's 2015 earthquake. "It could well just be gravity, but I would suspect the earthquake was the cause," he told the BBC. Mountaineers claim the snow-covered slope will be much easier to climb than the notorious rock-face, but have warned that it could create a bottleneck. It is a serious worry for those already battling low oxygen and frostbite conditions at the top of the world. Speaking to the BBC in 2012, British mountaineer Sir Chris Bonington said getting stuck near the Step could be fatal. "If it's a perfectly fine day, it doesn't really matter too much if you are delayed for say, an hour and a half, two hours on the Hillary Step, which is just short of the summit. "If the weather is breaking up, that two-and-a-half hour wait can be a matter of life and death." The routes up Everest from Nepal and Tibet are already very hazardous, the BBC's Richard Galpin reports. Four climbers were killed on Sunday, he says. 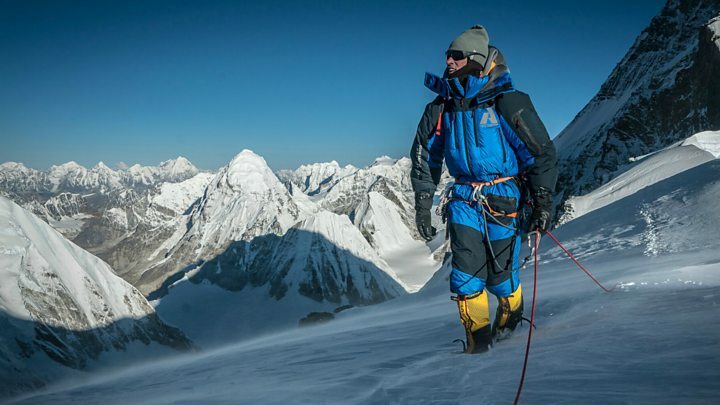 Media captionA British-born climber is using new methods to scale Mount Everest in half the time.